Following the recent reveal of Football Manager 2012 I was understandably very keen to find out whatever else I could about the new game. So here we now are, an interview the Sports Interactive Studio Director, Miles Jacobson. Read on for thoughts about ground breaking new features, skipping a year and more. 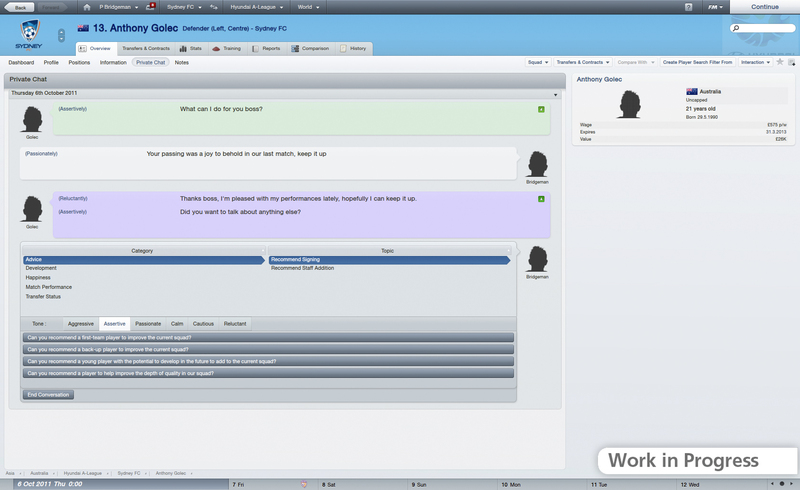 The Reticule – Football Manager 2012, we all knew the announcement was incoming, it is that time of the year after all. Do you think you will ever surprise us all and skip a year? Miles – That depends on whether I decide to have a holiday at some point! It’s unlikely though – we’ve got so many things we want to do with the FM series over the next few years, and what would all the FM fans do with their time if we did skip a year? The Reticule – One of the complaints that can very easily be thrown at you guys is that you often are simply making a game with an updated database and a few tweaks without anything ground breaking. Do you feel there is any validity to this? Miles – None at all – we’ve got over 800 new features this year. But “ground breaking” wise, we’re simulating the role of a football manager. We have a match engine. We have a transfer system. We have training. Tactics. Conversations with players. Conversations with the board. More than 50 countries leagues. It’s not as if they’ve introduced ice skates to football, or made it so that Orc’s can run onto the pitch and kill players, so I’m not really sure what “ground breaking” things people expect us to add – we’ve been the most innovative developer in the genre for nearly 20 years, constantly adding things that no one else has, which is maybe why we’re still around making games now. So we’ll continue to add revolutionary features to the genre. We’ll continue to evolve what we already have. And will try to be the best in the genre every year, and release games that are better than those we’ve released before every year too. The Reticule – Are you making any major changes to the game, or is 2012 another case of ‘evolution, not revolution’? Miles – There are elements of revolution, such as the tone system, “anytime, anywhere”, the contract negotiation locks, the scouting reports, the adaptive layout and some things that haven’t been announced yet. And will continue to evolve too. The Reticule – The feature which really struck me as being a big improvement was the newly announced ability to add new leagues to the game as you play. How difficult has this been to implement? Miles – It’s been being worked on in the background for a few years. The hardest part was the thought process behind it, really, as there’s been a lot of debate about the best way to do it. That and not breaking things by adding it in! The Reticule – Do you think this will make a big difference to how people play the game and what leagues they try out? Miles – It’ll make a difference to those who play long career games, for sure. The Reticule – Last year saw the launch of the Dynamic Reputation System, how successful was it last time out, and how have you improved on it? Miles – It’s gone down very well with the long term career gamers, and has made a big difference to the series. There’ve been a few tweaks, but it works well, so no need for any overhauls. The Reticule – Something I would love to see would be a challenge mode where you are put in charge of a club with the immediate task of say, saving them from relegation with five league matches to go. Is this something you guys would consider putting into the game? Miles – We’ve considered it many times. The Reticule – Have you ever considered turning the Football Manager games into free-to-play titles? Miles – We announced a few months ago a partnership with KTH in South Korea to make a game called Football Manager Online which is free-to-play with microtransctions. It’ll be released in South Korea next year. The Reticule – Will 2012 use Steam again, and if so, how deep will the integration be? Miles – It will use Steam again, yes. I don’t believe we’ve announced anything we’re doing in this area yet. The Reticule – Have you thought about moving into other sports again like with Out of the Park Baseball and NHL Eastside Hockey? Miles – It’s not something we’re looking at currently. Whilst OotP and Eastside were both great games, and OotP our highest reviewed game ever, the public didn’t take to them in the kind of numbers that made sense for us. The Reticule – Do you have any plans to go back onto the 360 or PS3? Miles – It’s highly unlikely – the demand just isn’t there. The Reticule – Finally, what is the one feature that excites you most about the new game? Miles – At the moment, of the things announced, I get most use out of the contract locks. Being able to set a fixed wage, for example, can lead to some fascinating negotiations with the agents. 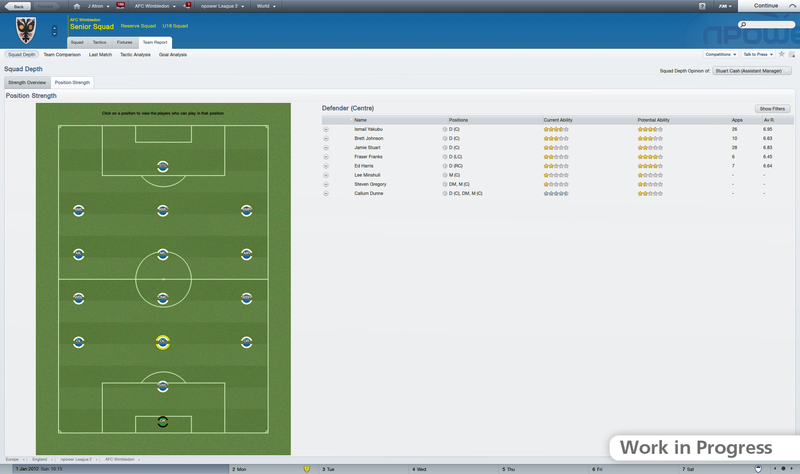 Football Manager is so very far out of my personal gaming comfort zone, but I am genuinely impressed by it. The podcast that Miles did with Eurogamer last year is an essential listen if you’re unfamiliar with the incredible scale of the operation. (I believe it was: http://www.eurogamer.net/articles/2010-11-16-eurogamer-net-podcast-45-blog-entry). Oh, and Miles is incredibly passionate about games (video and foot based) and just generally a credit to the industry (is it unprofessional to say that? Probably :P). So well done for pinning him down for an interview!